Get the best value for your money with our top class man and van service in Knowsley. Why bother paying more when you can get elite removal services for less money. Our rates are lower than average and the reason for that is the fact that we want our customers to be fully satisfied. We train our helpers in-house and we pay special attention to their social skills as well. We demand that our workers are not only skilled but friendly and outgoing as well. We also have all the needed supplies for a successful removal. We have high end removal tools for latching, lifting and towing. Our moving pads and blankets will save your furniture from scratches and damages. In addition to that we also have full insurance so you are entitled to a refund if anything goes wrong somehow. We also have flexible hours so that you can get our premium man and van services at any time you wish. You can even get us for an emergency relocation but we recommend that you book in advance. This is not only to make sure that we have available hours but to also allow for planning and customisation of your relocation. Our lines are open 24/7 but you can also pay us a visit at one of our office. Come and get a free consult. Knowsley is a large village in the Metropolitan Borough of Knowsley in Merseyside. The parish was formed during the 1974 and today the population in it is over 11,000. Here are situated three main areas: the village of Knowsley, the business park and a suburban area. The village is home to Knowsley Hall and Knowsley Safari Park. This zoological park is a main attraction in the whole area and it is a member of British and Irish Association of Zoos and Aquariums. Choosing the right removal services company is not always easy. The internet is full of customer horror stories and that an already difficult choice even more complicated. We understand that a successful client – company relationship can only be build on trust. That is why we try to implement open doors policy in every aspect of our business so that we’re as transparent as possible for out customers. We are the type of company that rejects hidden costs or cutting corners. Our customers pay to get a services – man and van in Knowsley and we’re obliged to put only our 100% into the job. No matter if it’s office or house removals in Knowsley – they are done swiftly and safely. All items you want us to transport will be handled with care so you don’ have to worry about your bed, furniture or electronics – we guarantee they will be moved to the new location without a scratch. Our movers have years of experience in arranging and moving items in the safest way possible. Van hire in Knowsley has never been more reliable. With us you will save time and money that you can spend with your family or invest in your business. Call our for a free non-obligatory quotation and our friendly customer support team will consult you on which service of ours is most appropriate for your moving and we’ll send a man and van in Knowsley to your address at a date and time convenient for you. Contact us today via phone or email and take advantage of the best man with van Knowsley’s got to offer. With highly professional movers and support team available for contact (via phone or email) 24 hours, seven days a week – we’re the right choice in removal services in the village of Knowsley. 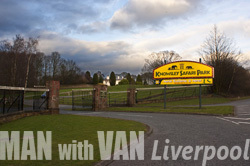 Man with Van Liverpool offers a selection of professional removal and delivery services suitable for a range of purposes. We service both private and business customers and customise our solutions in order to meet individual requirements, which saves people time, money and resources. We are also licensed and qualified to organise and provide additional services like home and office clearances, storage solutions, domestic and commercial waste removals, professional property cleaning etc. These are available as standalone, or as part of the removal service customers have secured with us. Knowsley is one of the metropolitan boroughs of the county of Merseyside in England. It has a population of nearly 150 thousand and covers an area of about 33 square miles. 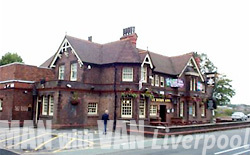 It takes it’s name after Knowsley or as often called – Knowsley Village. It is civil parish and a village of some 11 thousand people. It’s name as with most town as villages is of Anglo-Saxon origin. It is derived from Cēnwulfes lēah – Cēnwulf’s meadow. Interestingly Knowsley was found centuries before it’s much bigger neighbour – the town of Liverpool. Earliest literary sources are from the 11th century but archeological finds show the village to be much older. Like much of the surrounding ares it was historically part ot the county of Lancashire. Knowsley Village can can be divided in two main areas – the private esate and the counsil estate. Points of interest of the village are the Anglican church of St. Mary’s and the Roman Catholic – St John Fisher. The former school – Milbrook Manor, now serves as a restaurant. Knowsley is a metropolitan borough in Merseyside, England. Formed in nineteen seventy four, the borough incorporated a number of former rural districts which were becoming more urbanised. Two of the main places of interest in the borough today are Knowsley Hall and Knowsley Safari Park – the latter one of the most popular attraction in the area.